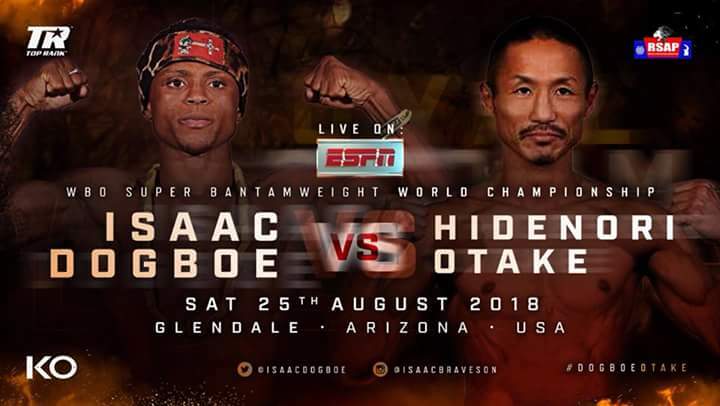 The countdown to Isaac ‘Royal Storm’ Dogboe’s first WBO junior featherweight title defence against Hidenori Otake of Japan is officially on after Top Rank Promotions announced on Monday that tickets for the bout scheduled for the Gila River Arena in Glendale, Arizona, USA on August 25 will begin selling this Thursday. Dogboe’s first defence of the title he won by stopping Jessie Magdaleno in Philadelphia on April 28 is a co-main feature with WBO lightweight champ, Ray Beltran’s own maiden title defence against Joe Pedraza, a former junior lightweight world champion from Puerto Rico which will screen live on ESPN and ESPN Deportes at 10:30 p.m. ET, with undercard action streaming live beginning at 7:30 p.m. ET. on ESPN+ — the recently-launched multi-sport, direct-to-consumer subscription streaming service from The Walt Disney Company’s Direct-to-Consumer & International segment in conjunction with ESPN. Accordingly, tickets to this world championship doubleheader, priced at $125, $75, $50, and $25, not including applicable fees, go on sale Thursday, July 26 at 10 a.m PST. Tickets can be purchased at the Gila River Arena Box Office, by phone at 800.745.3000, or online at www.gilariverarena.com. 23 year old Dogboe, the youngest world champion to come out of Ghana has been training in Accra ahead of departure to the US on August 5 for final preparations in Pennsylvania three weeks before fight night. “I’m making my first defense against Otake, a Japanese warrior. It’s going to be fireworks,” Dogboe said. “I’m not stepping back. We’re on a quest to make this division exciting and great again. We’re shaking up the division. Isaac ‘Royal Storm’ Dogboe, you all know I bring lightning and thunder,” the Ghanaian added. Otake (31-2-3, 14 KOs), a 36 year old from Japan will be taking only his second ever fight outside his country on the back of a 9-fight winning run dating back to his last and only previous bout abroad, a world title defeat to Scott Quigg in the UK back in 2014, during when he won the Oriental and Pacific Boxing Federation (OPBF) super bantamweight title and defended it three times including last March’s TKO victory over Brian Lobetania in Tokyo. I am truly grateful for this opportunity,” the Japanese hero said.